FOUND - Bestever CHOCOLATE ROSE RABBIT with Chocolate Aroma mmmmmm!! Home→FOUND→FOUND – Bestever CHOCOLATE ROSE RABBIT with Chocolate Aroma mmmmmm!! FOUND – Bestever CHOCOLATE ROSE RABBIT with Chocolate Aroma mmmmmm!! I edited the white version into a chocolate one! 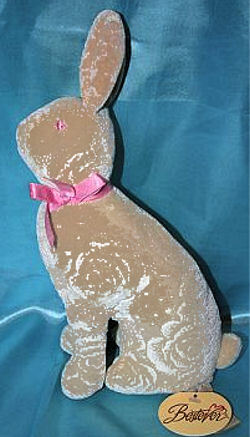 I’m looking for a brown colored stuffed bunny made with a fabric with a rose pattern. I think it was originally distributed by Hallmark in 2002, but recent searches indicate that it might have been manufactured by Bestever. It came in White Chocolate, Milk Chocolate, and Dark Chocolate versions. I’m looking for the Milk or Dark Chocolate version. The only other thing I remember about the bunny is that it had a faint chocolate smell. My daughter gave away her bunny during a purge of her room, but now regrets the decision terribly. Of all the stuffies she’s given away in the last few years, this the only one she still remembers and cries about. Any help tracking this down is appreciated! Thanks! If you can help Rebecca find this Bestever Chocolate Rose Fabric Scented Rabbit, THIS SITE IS NO LONGER ACTIVELY MANAGED. Please use Our FREE FACEBOOK GROUP, including #093008-3 in the subject, . If you find this bunny, please email me at oakstone3 at yahoo dot com. …or, send to the blogger account shown. Check your email, I’m sending you pictures of my dark chocolate bunny. Thank you, Ana, for finding and sending this bunny to me. She is in great shape and the smile on my daughter’s face is priceless. Thanks too, to this site for connecting me to Ana and bringing my long search to a successful end. Thank you, it’s always a pleasure to help you and others to find lost lovey. Such a great reward to make other people happy.